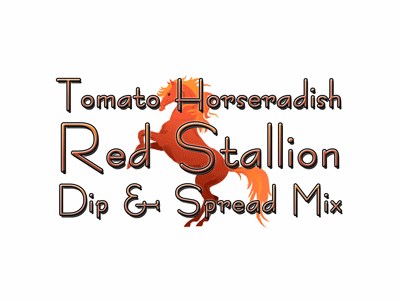 Description: Medium-spiced horseradish dip with a bold, sweet tomato flavor in a creamy dip. We've found it's great on hamburgers in place of ketchup and the perfect accompaniment to onion petals. Made with real tomato and horseradish.. Features: No added MSG. Gluten Free. Vegetarian / Vegan. Made from scratch, in small batches, from our own original recipe in Ohio. 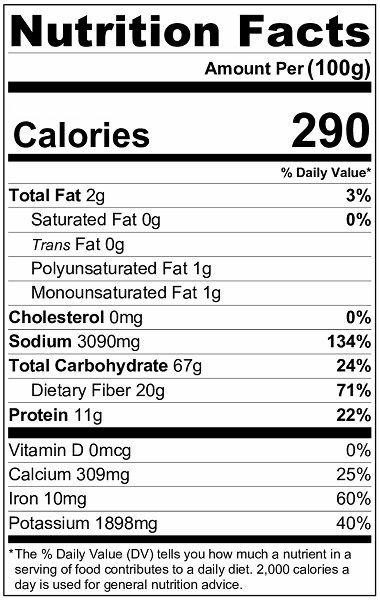 Abbreviated Ingredients: tomato powder, horseradish, herbs and spices, salt, garlic, onion, <2% silicon dioxide. 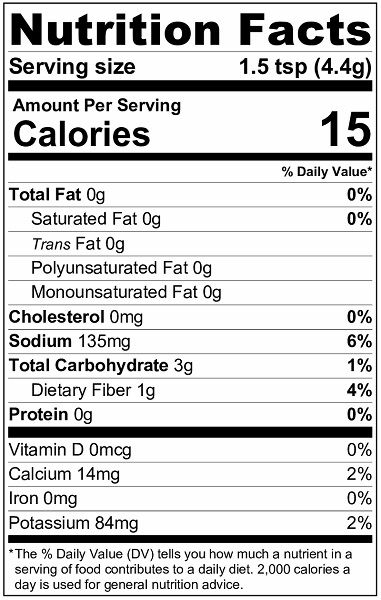 Packaged in a facility that handles wheat, milk, soy, egg, peanuts, and tree nuts. All the components of the favorite appetizer in a zesty dip. Serve with pretzels or crostino. ~ With an electric mixer on low speed, beat together all ingredients. ~ Chill at least 2 hours before serving. Sweet tomato and tangy horseradish in a cheddar cheese cheese ball, coated with bacon and chives. Does it get any better than this?! Serve with wheat crackers for spreading. ~ With an electric mixer on low speed, beat together dip mixes, cream cheese, and milk/sour cream; roll into a ball, chill until needed. ~ Mix together bacon and chives; spread evenly onto a large plate or a sheet of waxed paper. ~ Roll cheeseball in bacon/chive mixture to coat entire ball. Traditional condiments meld into a savory, tangy sauce that tops this wonderful gourmet hamburger. Perhaps it will become your secret sauce! ~ Stir together mayonnaise, mustard powder or mustard, and 2 Tbls. Tomato Horseradish Dip Mix. Refrigerate until needed. ~ In a medium bowl, stir together remaining (2 Tbls.) 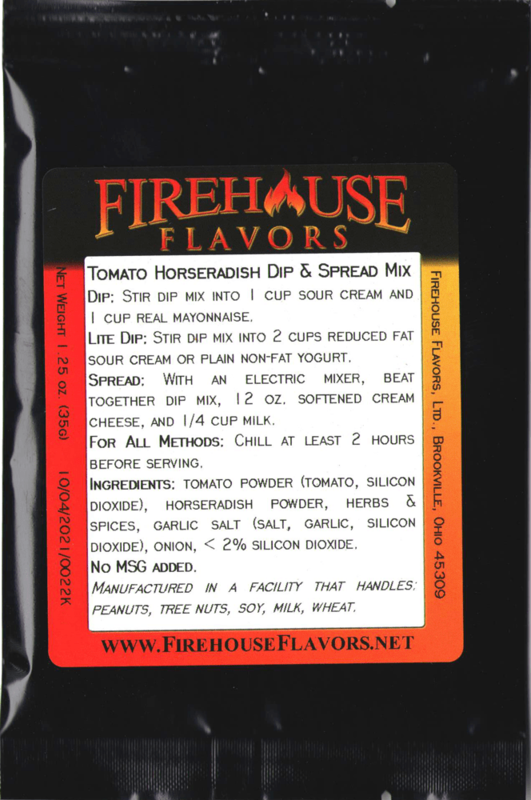 Tomato Horseradish Dip Mix with water. Knead in ground beef. Form mixture into 4 equal-sized patties. ~ Grill patties over medium heat until cooked as desired. Top with cheese, close grill lid, and allow cheese to melt. ~ Spread desired amount of prepared Horseradish Spread over each of the bottom buns. Top each with a cheeseburger and remaining bun.